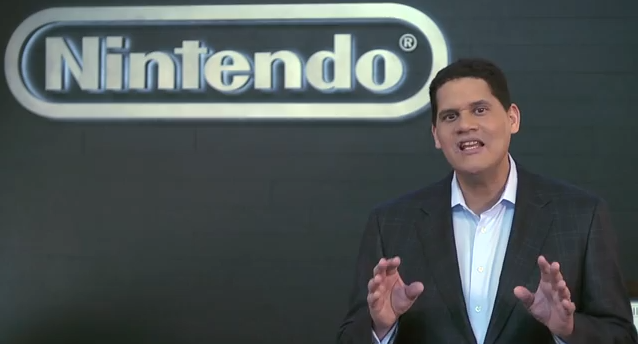 Nintendo just dropped its second Nintendo Direct presentation, featuring NOA President and COO, Reggie Fils-Aime. The video includes game and release date announcements and a couple of interviews. Highlights are an April 6th launch date for Xenoblade Chronicles, the reveal of a NA localization of The Last Story and the inclusion of the 3DS stand with every copy of Kid Icarus: Uprising. How terrible must your control scheme be if you have to include an extra peripheral to help you hold the damn system? Whatever, I’ll use it and pretend it’s a Virtual Boy. Reggie scares the hell out of me. He’s always so pleasant and positive, never waivering in his signature delivery of uber-marketing speak. When faced with tough questions from the press he never loses his composure, and fires back with his “kill ’em with kindness” style retorts. That said, you and I both know that you can’t climb to the top of the ladder without pulling a few other people off along the way. There’s no doubt in my mind that Reggie has killed more than one man that stood in his way via a stylus to the eye. “Happy gaming!” he surely said with a smile. Next time Reggie pulls a DS out of his jacket, run like hell.